This Saturday marked the 141st running of the Kentucky Derby, an event near and dear to my heart because I am from Kentucky and... I went to the Derby one time. It was cool! 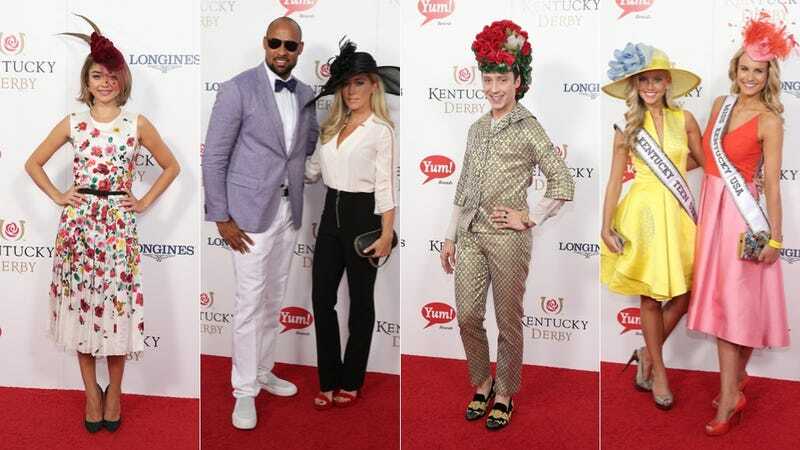 Anyway, this year’s race was host to a record-breaking crowd of over 170,000 mint julep-totin’, fancy hat wearin’ Southerners and a bunch of random minor celebrities, whose outfits we will be judging together in 3, 2...1, AND WE’RE OFF! First up is one of my favorite fashion phenomenons, NFL players in pastel. Behold: Alex Smith, Frostee Rucker, and Matt Shaughnessy, each accompanied by a hot-bodied lady in bodycon. These women were labeled on Getty as “Derby Princesses,” not sure what that means, but they look like amazing Easter eggs. Their purses match! Their stances are identical! WHO ARE THESE WOMEN?!?!? Oh dear. Here’s Kathryn Stockett, author of The Help, looking like a depressed peacock; Vanessa Lachey is wearing what appears to be a high-end airplane seat cushion on her head; my #1 baby girl Whitney Bischoff is looking discombobulated and wrinkled, but very tan! Ahhhh. Johnny Weir is wearing an actual rose mullet with a mint julep glass on his head, and Star Jones looks like her hat vomited a flamingo—safe to say that both are serving up the perfect level of tacky. Meanwhile, Tara Lapinski constructed some kind of braided nest-hat out of HAIR and it looks SO GOOD. Who the hell knows who these ladies are, but they are up to some weird twin stuff and I am enjoying it very much! Red florals abound: Model/actress/sportscaster (?) Bonnie-Jill Laflin flirts with the camera, Miss America Kira Kazantsev looks great but the makeup is a little costume-y; Sarah Hyland’s dress and hat are both awesome but...do they work together? The beauty queen brigade continues! Miss Kentucky Teen USA Caroline Ford looks like a freaking Barbie, as does her comrade, Miss Kentucky USA, whose hat is amazing and also pretty vaginal. On the far right we have Katie Himes, who is also apparently Miss Kentucky and honestly I’m starting to get confused. I’m also having some mild trouble understanding who this is, beyond the fact that her name is Shannon Voss and she’s a total attention hog who can’t let American Pharoah have his moment in the sun!!!!!!! Oh, and here we go, it wouldn’t be the Derby without Larry Birkhead trotting out Dannielynn in front of the press so everyone can remember what an amazing dad he is. Her hat is extremely cute. Here are some couples in uninspiring outfits: Actors David Walton and Majandra Delfino seem a little off (David, what is with the cream and white; Majandra, please remove those bangles); Kendra Wilkinson and Hank Baskett look low-key; Kentucky Governor Steve Beshear and his wife Jane looking regal. Ne-Yo and Ruben Studdard have some good stuff going on with these outfits—however, Shep Murray, co-founder of bro-outfitter Vineyard Vines, needs to cool it on the pink and lime green. Jesus, Shep. I am liking the level of crazy Miss United States Elizabeth Safrit is bringing here, but the hot pink is blinding; model Lindsay Ellingson looks demure and subtle and pretty damn perfect; no idea who Samantha Barber is but she needs a better outfit/hairdo to go with that hat. And here, finally, is Barbara Corcoran, badass businesswoman and Shark Tank investor, having the time of her effing life at the Derby. May the spirit of Barbara Corcoran move through you today, and all days.